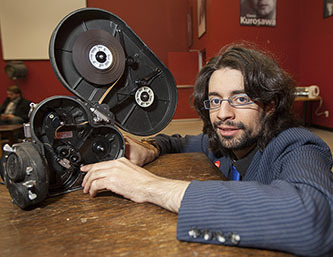 A French film student finds inspiration and artistic support at Brooklyn College. Morgann Gicquel handling a traditional 16 mm film camera. Morgann Gicquel is laser focused in his 8:30 a.m. cinematography workshop class despite the fact that he was burning the midnight oil the night before, only grabbing dinner at 1:00 a.m. over an old episode of The Sopranos. He has been keeping late hours recently because he is putting together a set for a film he is shooting. Gicquel (pronounced jee-kel) is an exchange student from France, one determined to make the most of the two semesters he will spend at Brooklyn College. So as the cinematography professor, William Hornsby, talks cookies, inkies, babies, and tweenies—all different types of lights—Gicquel takes copious notes and even measures some of the light emissions the professor demonstrates using a small tool on his desk. "This professor is my favorite," Gicquel says, "because he is lively and he knows his stuff." An aspiring director, Gicquel is working on a master's degree in film and production. He sought out Brooklyn College because he wanted to learn his craft on 16mm film stock, an all but forsaken medium that only a handful of colleges and universities still use to teach their students. It's also a medium, unlike the digital formats that are de rigueur today, that is not as forgiving of less than ideal lighting and shot set-up. "That's the main reason I wanted to come to Brooklyn College," Gicquel explains. "Film is a discipline. I wanted to learn the fundamentals." Gicquel is one of more than 400 international students enrolled in the college this semester, which is up from just over 300 students last year. His trip was facilitated by an organization known by its French acronym, MICEFA, a consortium of universities in France, the United States, and anglophone Canada that promote cultural and academic exchange. Because of that program and other institutional partnerships, Brooklyn College has more undergraduate international students from France than from any other country, though South Korea is a close second, followed by Russia, China, Japan, and Turkey. On the graduate level, the college hosts the most international students from India, followed by Turkey, Saudi Arabia, and South Korea. With a view toward bringing varying perspectives to the classroom and campus culture, the college seeks out students from around the globe who in turn find a homey environment on the campus as well as in the surrounding multi-ethnic neighborhoods. Gicquel, who sports blue, thin-rimmed glasses and a very full head of wavy brown hair, actually feels more comfortable in his craft here than back home, where he says film directing is not taken as seriously. He laments that at his college back in France students hardly get to practice making films. During the first year of his master's program back home, his classmates booed him when he said that writing and directing are two different artistries. "I thought, maybe I'm not cut out for this," he recalls. "It wasn't a happy environment to learn in." He is debating where he would like to make his career but America has some strong points in its favor. "I feel more validated as a filmmaker here," he says. What he does miss about home is that "in Paris, you can chill out in the city with practically no one at night and discover the architecture and feel like you own the city," he says. "It's pretty handy when you have to shoot a film or take pictures." Asked what he thinks he brings to the campus here, Gicquel says he is full of colorful perspectives that many students here have not considered. "I can definitely bring meters, which is a safer and more efficient way to calculate things than feet and pounds and whatnot," he teases. Jokes aside, Gicquel says he will go home with a lot of new skills and perspective in his field—and the comfort in knowing he picked the right country and the right college in which to grow. "I definitely fell into the right place," he says.